Don Kohlman at Nordhavn Yachts sends word that he's closed on the sale of the 26.4m motor yacht Aurora with Sean Moran at Moran Yacht & Ship introducing the buyer. 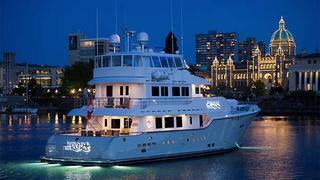 Built by Nordhavn in 2008, Aurora is a trideck yacht with flybridge. Accommodation is for six guests in a master suite and two convertible twin/double cabins while two 600hp Detroit Diesel engines give her a cruising speed of nine knots. Easily handled by an owner/operator or small crew, she is in excellent condition, having been kept in a boathouse since delivery.